Midwest Retail Services specializes in selling retail gondola shelving and accessories to stores in virtually every category. In fact, we’re one of the largest distributors of the best-known and trusted manufacturers of gondola shelving brands like Lozier, Streater, and Madix. We’ve even written several popular articles on the importance of professional store fixture installation and why fixture installation is more than simply knowing how to assemble shelves. But, sometimes you just need to know how to make a simple adjustment to your existing retail shelves, perhaps add an end unit, attach a power wing, switch to a different style back panel, or replace a component on an existing gondola unit. You may not feel the need for a full-service installation professional to visit your site for something like this, you just need to know how to find and make changes to “Tab-A” and “Slot-B” and you’re confident that you can do it yourself. We’re here to help you with that too. When we revamped the entire Midwest Retail Services website and blog in April of 2016, we expanded and reorganized our professional library of assembly instructions for retail fixtures and shelving. 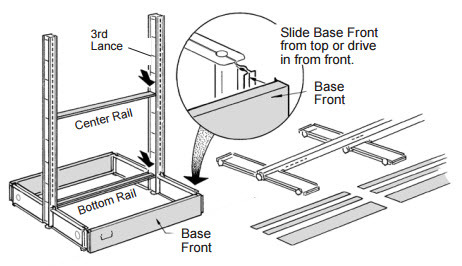 These are the same shelving and fixture diagrams and instructions published by the manufacturers and used by our own fixture installation professionals. Just visit our Fixture Installation page and download the PDF instructions that match your shelves — everything is sorted and organized by manufacturer. Whenever a new product or revised instructions are released by one of our gondola shelving manufacturing partners, we do our best to revise or replace on our website as quickly as possible. And if you can’t find a specific set of instructions you seek, just contact us and we’ll be happy to see if it’s something we can add to our selection. When you need help with your retail fixtures — from start to finish — call on Midwest Retail Services! This entry was posted in Selecting Your Display Fixtures, Store Fixture Services, Technology and tagged Convenience Store Shelving, Display Fixtures and Shelving, expert advice, Gondola Shelving, Grocery Store Shelving, improving store layout, Problem-Solving, resources, Retail fixture, Store Shelving, Tips I Can Use, Your Display Fixture Rollout by Midwest Retail Services. Bookmark the permalink.